This site provides a simple bookmarking service. They follow your twitter feed, and whenever one of your tweets contains URLs, they add them to your delicious.com bookmarks. Optionally, bookmark URLs in @replies to you. They’ll even add a delicious tag identifying the sender if you like. The pack rat keeps track of the URLs you share. 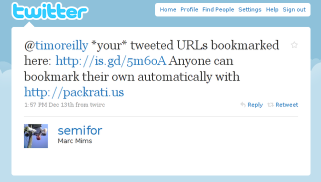 If you don’t want to post them to multiple places.Just tweet the URLs that interest you, and Ratius T. Packrat will add them to your delicious.com bookmarks for you. He’ll use any hashtags you include as tags for your bookmark and include the full text of the tweet in the bookmark comments. Why IPad let us down ! !